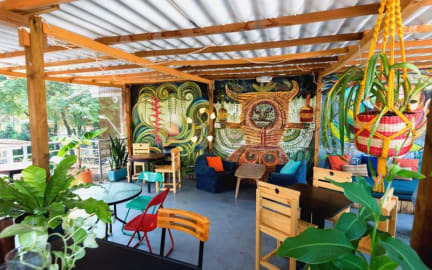 El Alternativo is a new and inventive place to stay in Medellin and enjoy an original, friendly and Eco responsible atmosphere. On the roof, guests have use of a wonderful terrace and a kitchen. Opening on the street, the café hosts exhibitions and cultural activities. It serves natural juices, local coffee and organic tea, but also wine, beer and flavored rum. It’s a nice way to learn more about the city and meet local people. 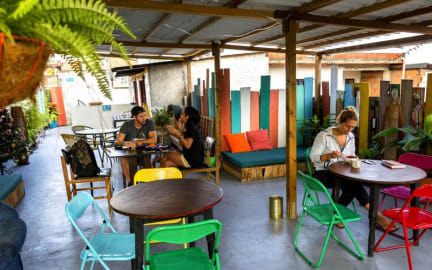 El Alternativo is located in the safe, peaceful and bohemian neighborhood of Manila, in the district of Poblado.The hostel is very close to the metro station, buses and taxis make it easy to go anywhere in Medellin. And to go anywhere in Colombia, a taxi can take you in a few minutes and for less than 2 euros or dollars to the domestic flights airport or one of the two big bus terminals of the city. Manila lies away from the frenzy of Parque Lleras, but it's only a short and safe walk to go and get into it. They have a supermarket, an ATM, a metro station and bus lines at less than 5 minutes’ walk and can reach in less than 10 the famous Parque Lleras and the 'Zona Rosa', heart of the nightlife in Medellin. Each private room and dormitory has a colorful and personalized decoration with handmade furniture. Dorms accommodate 4 or 6 guests and are well equipped with wide beds, lockers and numerous power sockets we also rent towels and propose laundry facilities. The private room contains double beds and their guests have towels at their disposal. Nice, friendly hostel. Double room was nice and clean, great roof terrace with proper kitchen. Vibe in the hostel was good, though not the most vibrant part of El poblado. Look for the local '' street" burritos (Las delicias de la flaca for instance) instead of the overpriced restaurants in this area. All in all, pleasant stay for a fair price: Def recommend. Such a nice hostel. It's perfectly clean, all beds come with power outlets, breakfast is great with some options and all people working here are super friendly. The location is great, close to the metro and zona rosa, but in a more quiet neighboorhood for a good night of sleep and some really nice restaurants around. No typical partyplace but still social. Really recommend this place. Perfect hostel if you’re looking for a way to relax on a budget. You don’t meet a lot of other travellers since there’s no central bar area where everybody gathers. Bonus points for David, one of the staff members, which is an extremely funny and helpful guy. Love him! Het was vooral een hostel waar men samen komt om boven op t dakterras wat met elkaar te roken. Het ontbijt was prima, echter had de dame in de keuken niet altijd een glimlach omdat ze eerst lang bezig was met het opruimen van alle troep men de avond ervoor had achtergelaten. Daardoor liep het ontbijt uit. Jongens van de receptie wel heel vriendelijk en de kamer was geluiddicht en fijn. Hebben er goed geslapen! Nice hostel with an awesome backyard where you can chill in the hammocks or watch tv in the lounch seats. The staff is friendly and the location is on walking distance from the city centre. Dorm room was so hot and stuffy during the night (no windows, only one fan), would not recommend to stay here. Staff was super nice tho. Staff was really nice, location excellent and rooftop also chill. Rooms a little small. We had to leave this hostel because our room(private next to the stairs and shared shower) smelled heavily to sewer. We already saw comments about this months ago. So we thaught the acommodation was already fixed. It is really bad that they still put people in this room and ask money for it. After we left they also put people in this room. This is a real nogo! They gave us a good sollution though. Na het lezen van de goede recensies besloten we dit hostel te boeken. Het was een enorme tegenvaller! Hoewel personeel, bedden, badkamers en keuken allemaal prima in orde zijn, is er geen énkele sfeer in het hostel. Reizigers zijn erg op zichzelf en er heerst geen sociale vibe. Het hostel organiseert ook geen activiteiten. Wij zijn naar de overkant verhuisd (Los Patio’s), je betaalt iets meer maar dat is het zeker waard! !